It was awesome. For comparison, you can also read my 2 month old review. The menu did change slightly with different variations to some of the dishes, but it was just as good if not better than my last visit. Sure, it sucked in some ways to have to go to this again so soon, but at least it was a very delicious meal. 1. 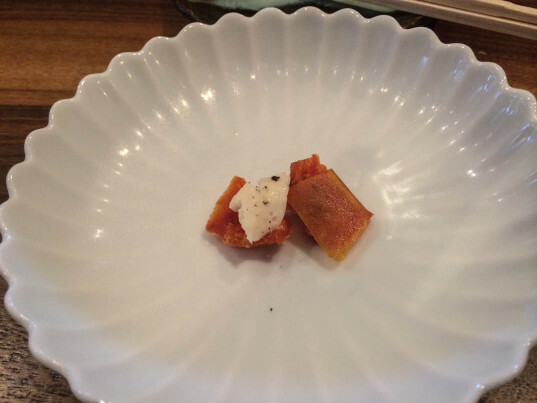 Dried parsnip, cheese, and mullet roe from Taiwan. This was a little snack to get us excited about the forthcoming dishes. The mullet roe I have never had before. It had a slight jerky type of texture and wasn’t really that fishy. 2. 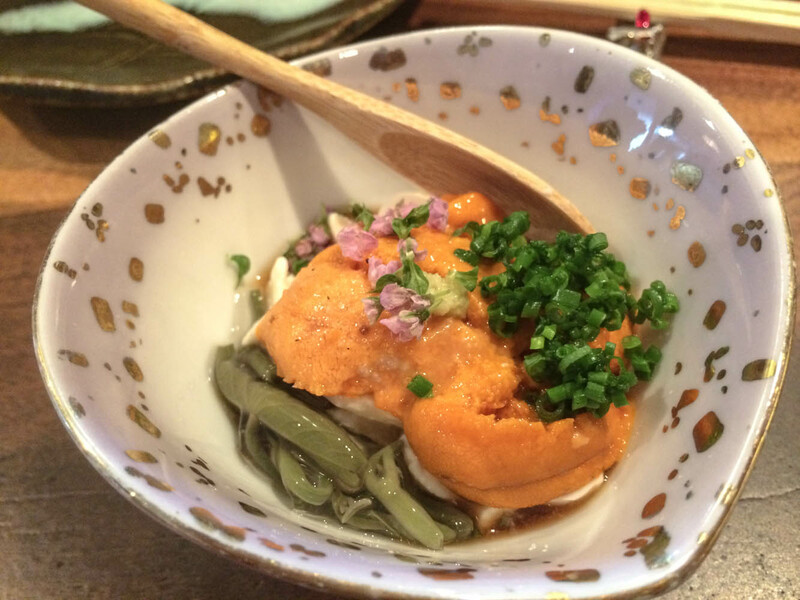 Tofu, Hokkaido sea urchin, real wasasbe, and Japanese scallions. This was similar to a dish that I had the last time except he added that strange jelly green stem. 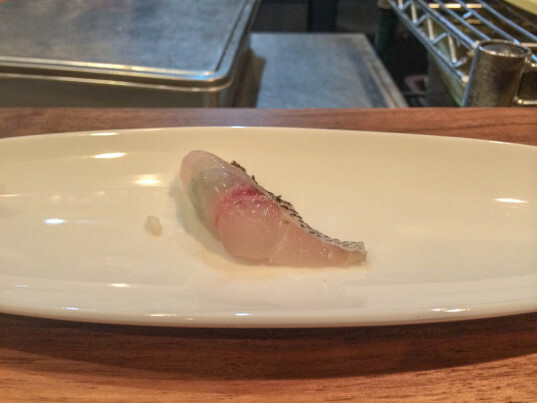 The little florals on top of the dish gave it a very nice distinct taste. The Japanese scallions, unlike regular green onions, provided a sweet taste too. As usual, Hokkaido uni was superb. 3. 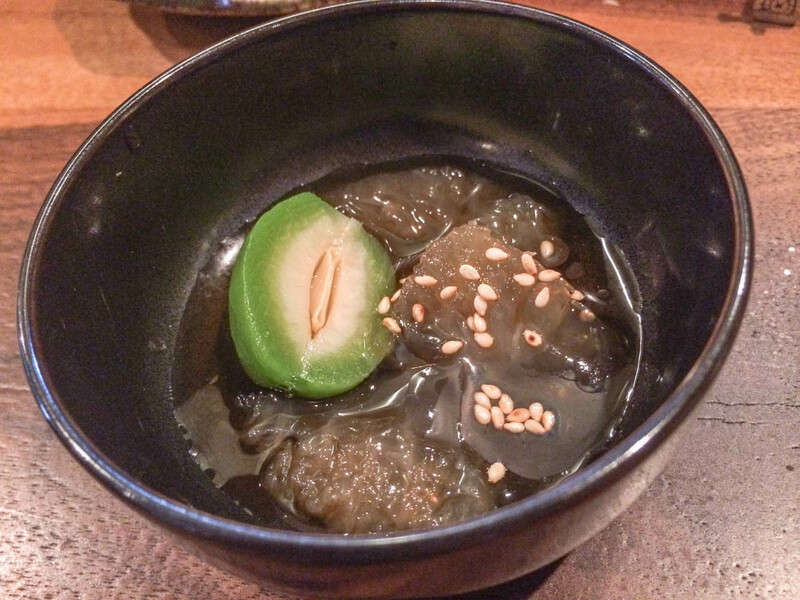 Jellyfish with Japanese baby peach. This was way better than I last remember. The jellyfish was super crunchy and slick. The baby peach was very sweet and not as mushy as before. 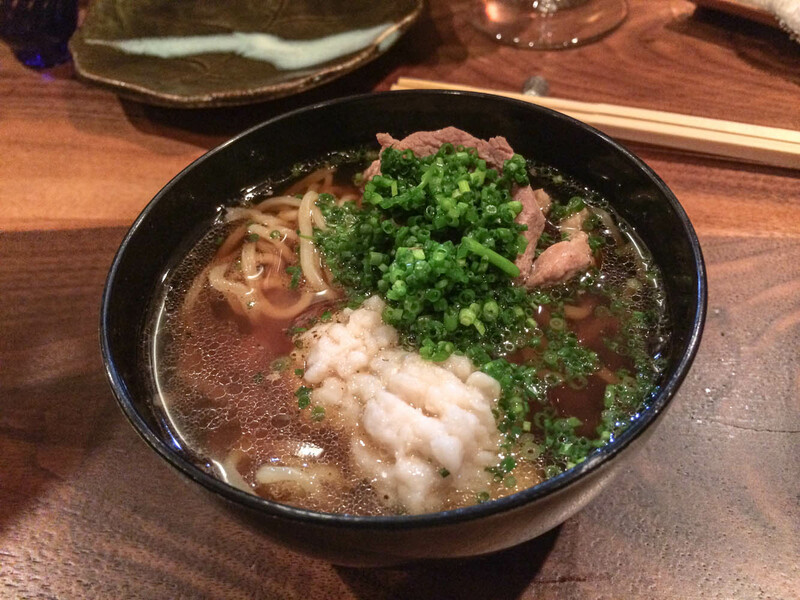 The broth was an acidic ponzu type of concoction and was so good with these 2 ingredients. 4. Special see eel hamo, avocado, and sea urchin. 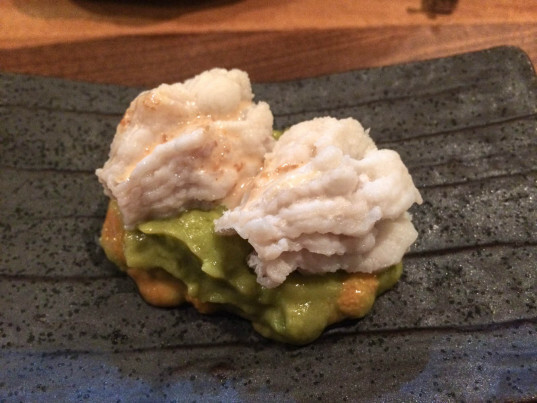 The eel was poached and sits on a bed of an avocado and sea urchin mix. What was very good about this was that the avocado mixture had a little kick to it from some serrano peppers. There also was some type of citrus zest to give it a sour flavor as well. 5. 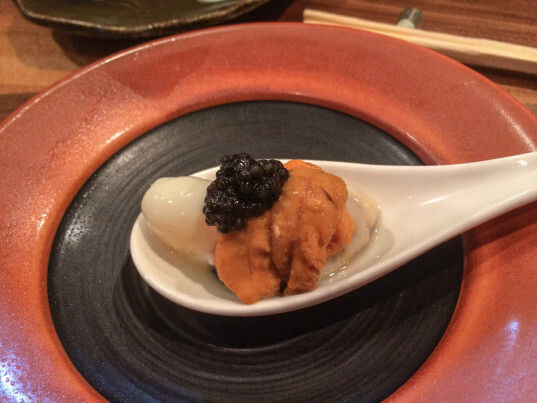 Kushi oyster, quail egg, caviar, and truffle yuzu shooter. Sublime. The oyster was very fresh. The caviar gave it that slight salty kick. The quail egg gave it the creamy texture. It’s interesting because they not only amalgamated well, but you could easily taste each of the components separately. 6. 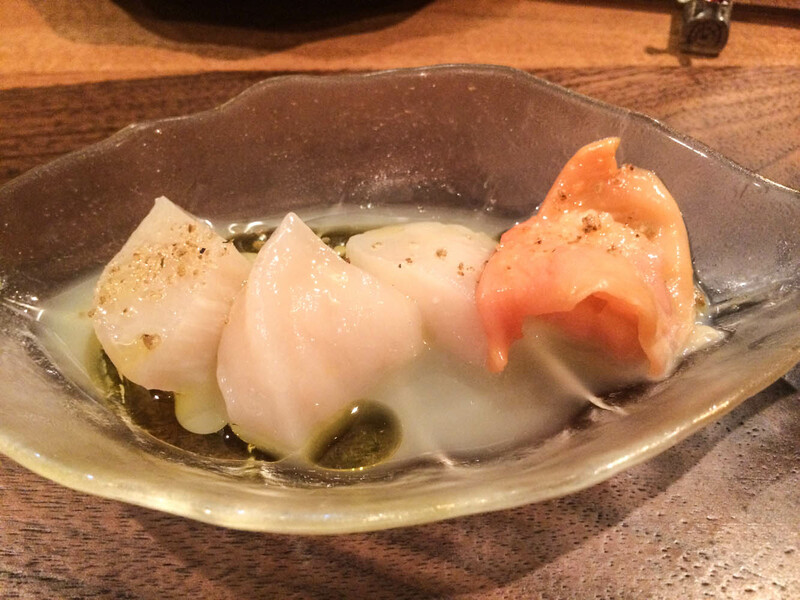 Clam, Hokkaido scallop, Pen scallop (far left). 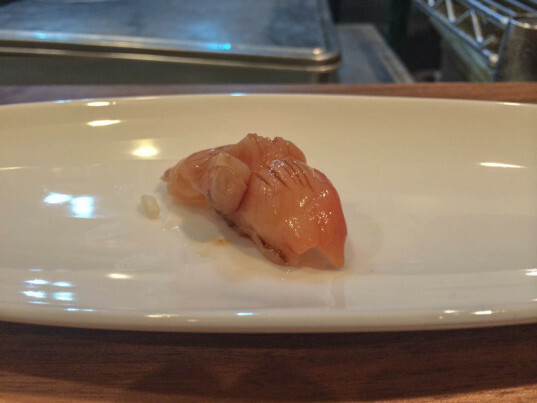 Like before, this was an interesting scallop tasting dish. The second time around, I really enjoyed both scallops equally since they were very different. The pen scallop was crispy, and the Hokkaido scallop was super soft. Both had distinctive flavors which I can’t really describe. 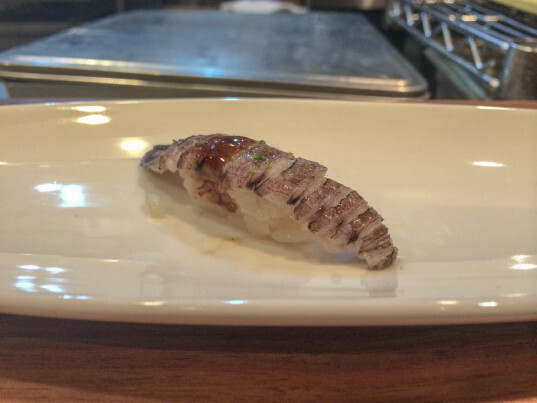 The clam itself as expected was crispy with its own unique sea flavors. 7. 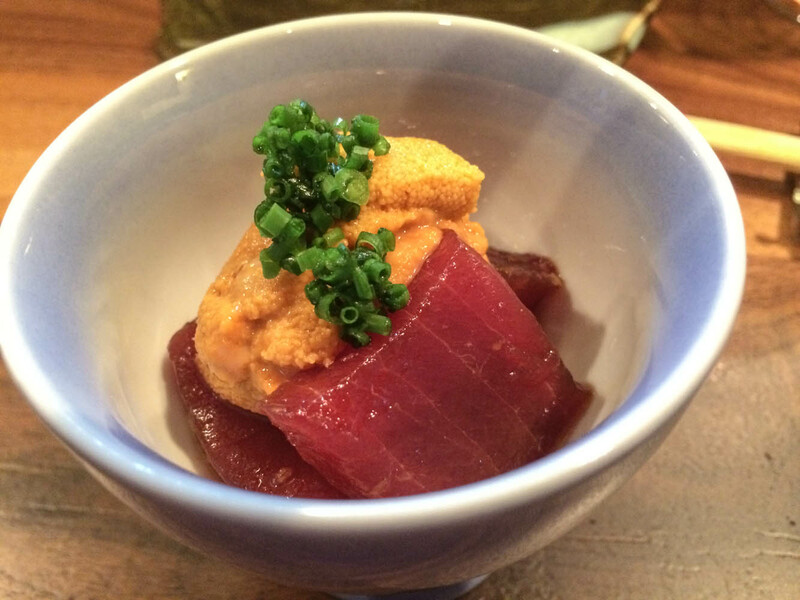 Marinated blue fin tuna, sea urchin from San Diego, and crab guts on bottom. The tuna was firm but also delicate. 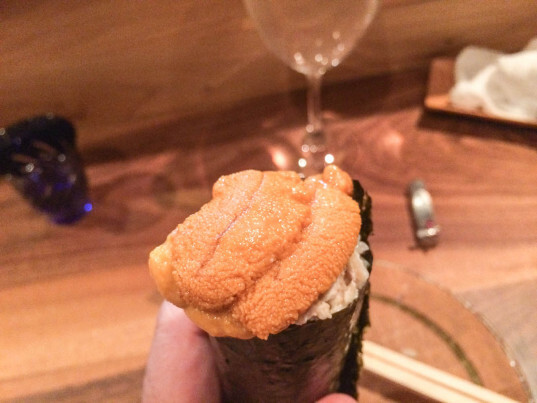 The sea urchin itself tasted pretty different than Santa Barbara and Hokkaido variants. 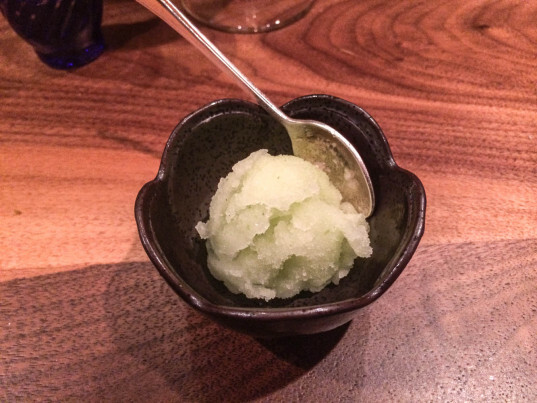 This was one was sweet and creamy, but it wasn’t as flavorful as the Hokkaido uni. 8. Japanese grouper sashimi with sesame sauce and flowers. The grouper was texturally firm, and the sesame sauce and floral decorations gave it a very nice aroma. 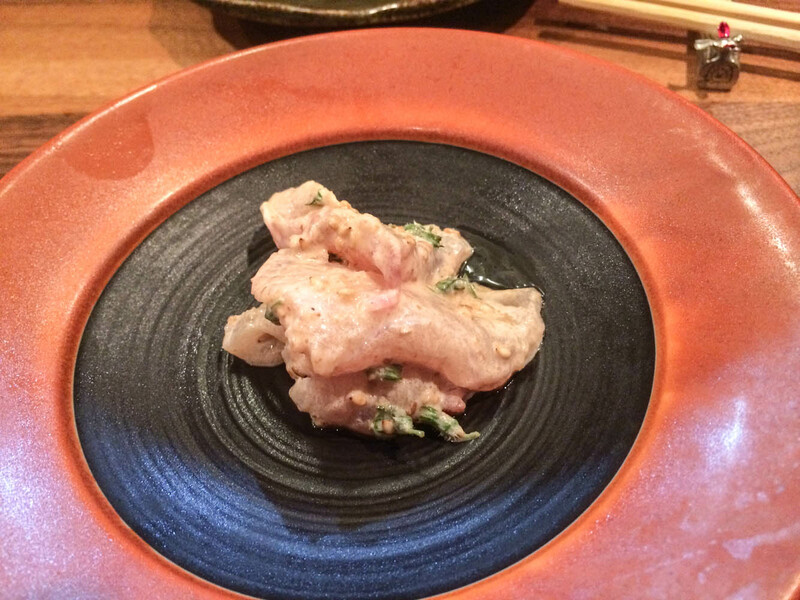 It was a very simple dish that was really good. 9. 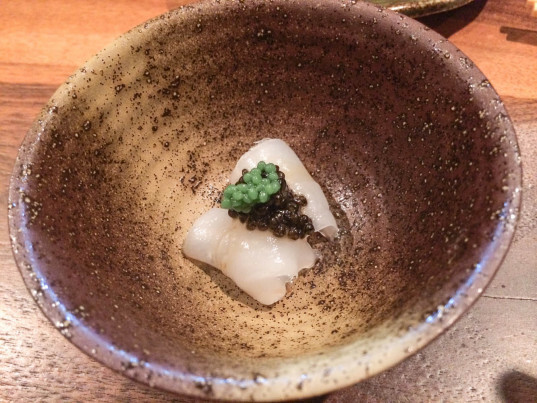 Special squid from Kyushu, caviar, and basil flavored circle things. This was pretty interesting. The squid was good along with the caviar. The real star of this was the little green balls. Each one had a very potent explosion of basil flavor. 10. Japanese oyster, tomato, truffle oil, and serrano ceviche. 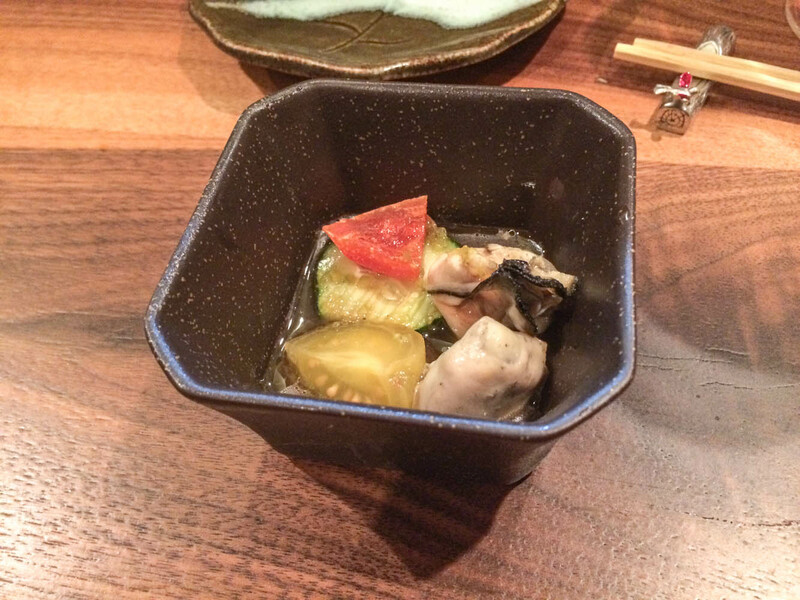 The oyster was very meaty and fresh. The tomatoes were marinated in some type of cold house broth over night and was super tasty. As usual, the serrano kicks to this really adds yum value to it. 11. 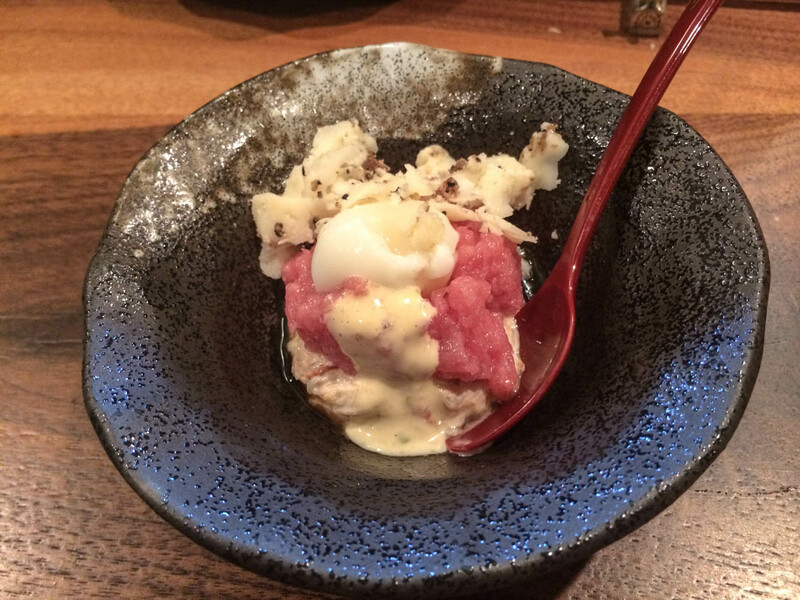 Truffle cheese, quail egg, toro, and blue crab tartare. Like the last time, this was phenomenal. There’s no shrimp here this time around, but the blue crab tartare with the toro were simply sublime with the truffle cheese. 12. Not pictured – Chawanmushi with steam egg, shrimp, some fish, and crab. I can’t seem to find any picture of this off my phone, so I must’ve been super hungry and devoured this. The broth from all the ingredients gave it a super sweet flavor. 13. 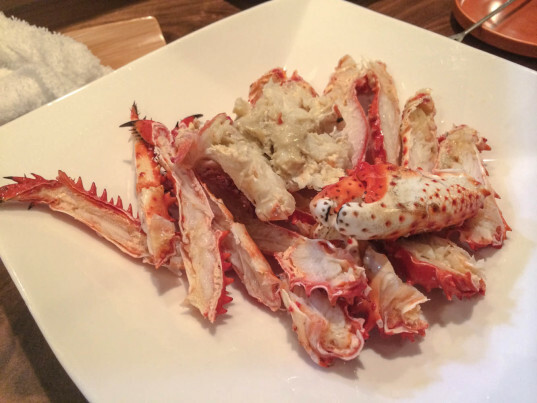 Hanasaki crab from Hokkaido. The crab meat was very sweet and delicious, and like last time pulled out easy. This was much sweeter than the hairy crab. 14. Ramen, Japanese green onion, special eel, and duck. The ramen was nicely cooked, not too firm and not soft. The broth was really good. I could use this on a daily basis as broth for some top ramen. The duck and eel were the protein stars in this and were all tender. 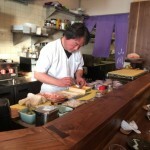 The chef was not hesitant in pouring the scallions over the broth, and for good reason too. The combination of the ingredients were all out of this world. 15. Bread, truffle butter, sea urchin, blue crab tartare, and frozen toro. 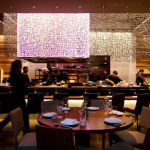 One could say toro is delicious. 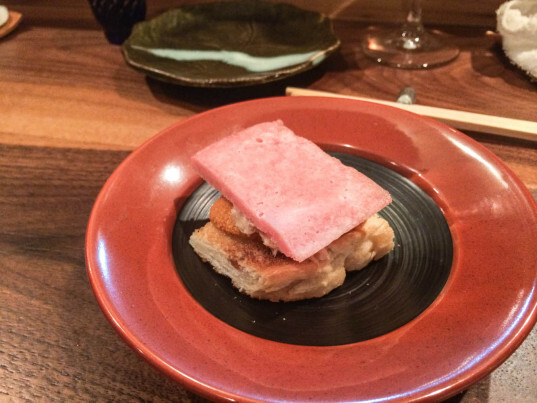 I will say frozen toro should be the new spam on bread if money was not an issue. The combination of all these ingredients can only be a snack for what’s to come next. 16. 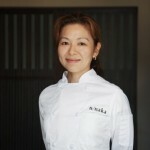 A5 premium beef from Miyazaki. This is not kobe beef, BUT this was way better. The beef was literally melt in your mouth delicious goodness. 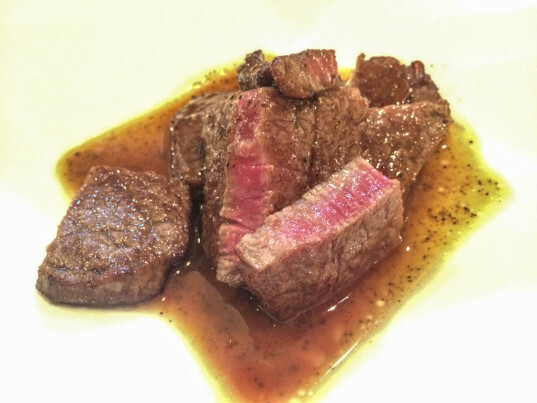 Cooked to a perfect medium rare and served with a ponzu type of sauce, it was hearty but not fatty like kobe. This is one of my favorite dishes for tonight. 17. 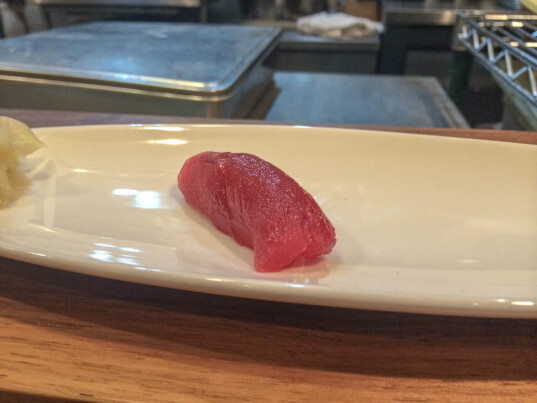 Blue fin loin. Two words: buttery soft. 18. 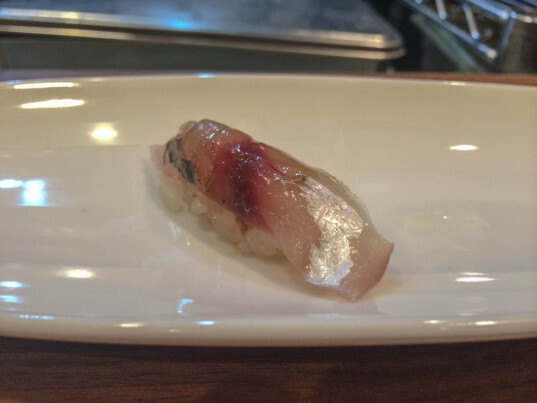 Japanese rock fish. Three words: fresh and easy. 19. Clam. Two words: delicately crispy. 20. Japanese mantis shrimp. Lobster and crab make this offspring. 21. Aji (mackerel). Ginger at the bottom with some careful love. 22. Toro. 1 word: OMGWTFBBQ. 23. 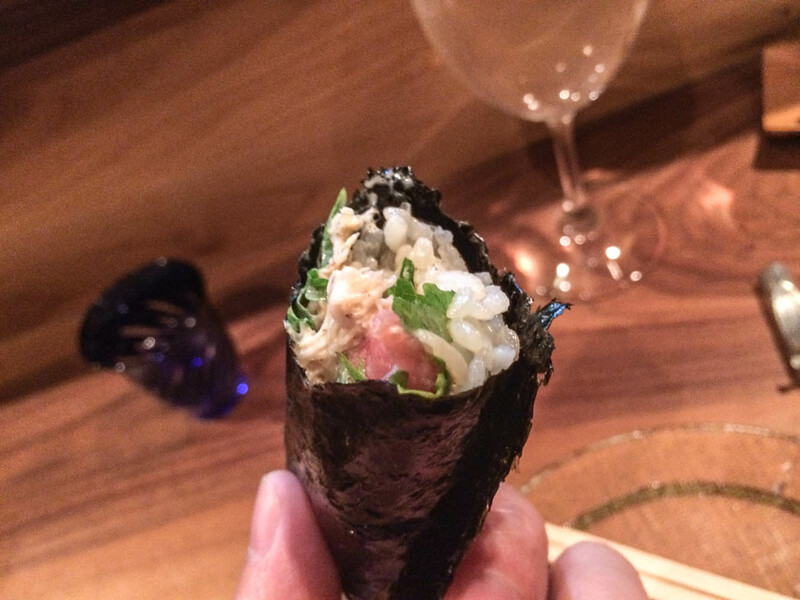 Hand roll with sea urchin, blue crab, and toro. 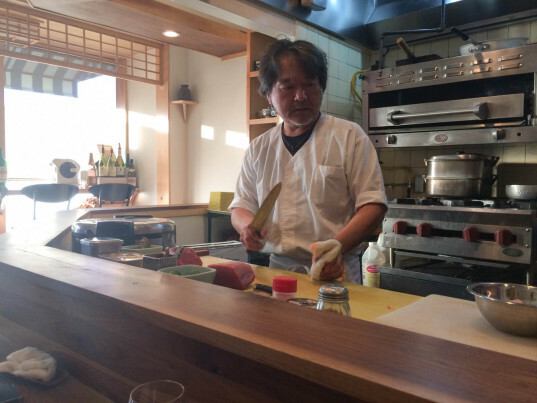 Unlike last time, the chef used a different type of seaweed. It was VERY crispy and so very delicate. A patron to the left of me decided to wait for his friend to get hers, but the chef glared at him and told him that he’s wasting it. The paper turned soggy very quick for him. After you get past the uni, this is how the middle looks like. There is a shiso leaf in the middle that gives it a very nice aroma. 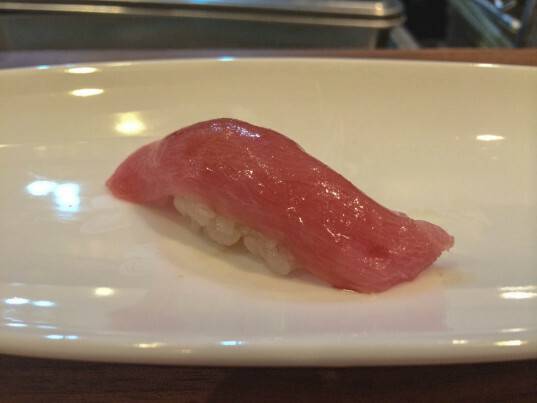 This hand roll is making me drool over my keyboard as I am typing this. 24. Peach sorbet. This definitely helped settle everything in my system down. By this time of night, it was only 11 PM. I am guessing the reason why the dinner experience wasn’t as long as last time was because there were only 8 diners compared to 10. I definitely don’t regret going to this place again at such short notice. I joked to the other patrons that I felt obligated to go, but that’s just me coming up with a lame excuse to go. 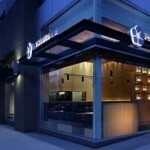 The chef remembered me, and I told him I will be back for seasonal dishes. I think I could eat this 4 times a year easy. Anyone want to go again in a few months? I tried to get an invitation at Yamakase for me & my friends, but was unable to do so (left messages at their website 3 times). What is the best way to get invited? Thanks in advance for your help. The best way is to make sure that you leave your schedule entirely open (or be extremely flexible) for a month or two. You can’t be selective with dates. The host(ess) will only reply if there is an opening.